Graphic description: Figure a shows the eye diagrams of the transmitted NRZ and PAM-4 signal. Figure b shows the picture of the experimental set up. Figure c shows the eye diagrams of the received Duobinary and PAM-4 signal. Figure d shows a schematic of passive optical network..
With the worldwide applications of emerging multi-media services and mobile fronthaul, the user's bandwidth demand is constantly increasing. So the passive optical network (PON) with 100 Gb/s system capacity supporting 25 Gb/s data rate per wavelength is actively discussed and studied. In order to achieve 25 Gb/s data rate per wavelength for upstream signals, modulation formats, optical devices and the technical solutions supporting burst-mode transmission while overcoming accumulated chromatic dispersion become the main factors to be considered. How to achieve better performance with reduced system cost is a critical problem for 100 Gb/s PON in upstream links. 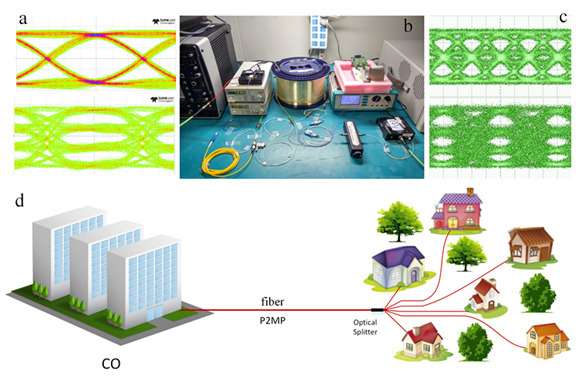 A scheme of partial chromatic dispersion compensation combined with advanced modulation formats is proposed to solve the above-mentioned problems by Professor Lilin Yi's group, from State Key Laboratory of Advanced Optical Communication Systems and Networks, Shanghai Jiao Tong University. By employing low cost optical devices, upstream 0-40 km transmission of 25 Gb/s per wavelength has been achieved. The research result is reported in Chinese Optics Letters Volume 15, No. 2, 2017 (Honglin Ji, et al., Upstream Dispersion Management of 25 Gb/s Duobinary and PAM-4 Signals to Support 0-40 km Differential Reach). In order to achieve 25 Gb/s data rate per wavelength for upstream signals, they use 10 GHz electro-modulation laser (EML) based electrical duo-binary (EDB) and quaternary level pulse amplitude modulation (PAM-4) format with optical dispersion compensation (ODC) in optical line terminal (OLT) side. To overcome the accumulated chromatic dispersion while considering the positive and negative dispersion tolerance of EDB or PAM-4, partial dispersion compensation method is employed to support 0-40 km differential reach. And the EDB-based modulation scheme achieves the highest uplink power budget of 39.5 dB so far. Therefore, EML based EDB format in ONU side combined with ODC in OLT will be an attractive solution for the upstream data transmission in symmetric 100 G-PONs. Professor Weisheng Hu from the research group believes that the proposed partial dispersion compensation method combined with advanced modulation formats can achieve higher transmission data rate, higher power budget with low cost, which will facilitate the 100G-PON standardization and deployment. The following works will mainly focus on the deep analysis of the system performance and the system stability in the long-term measurement.